Editor's Note: Tuesday’s American Morning audience sharply rejected the idea of racism as the impetus for discontent with President Obama. Most denounced Mr. Obama’s position on the issues and remarked that President Bush received the same treatment. Donald: John Roberts asked "where is the level of disrespect coming from?" Why wasn't this question asked for 8 yrs when Bush was in office? Most people don't want their health care touched. I, however, am in favor of reform. Michele: Why don't you compare the attacks against Obama to the ones against BUSH? Was that racism also? CNN be fair! I had NEVER seen anything like what was done to Bush and Palin as well! RACISM? COME ONE? Look at REV WRIGHT'S words? CNN feeds the race card, it's getting OLD. Alvina: Please don't stir up the dislike for Obama on the basis of COLOR. Color has NOTHING to do with it. I voted for him, but I hate his aggressiveness to CHANGE everything so FAST WITH NO INFORMATION TO THE AMERICAN PEOPLE ON THEIR HEALTH CARE PLAN. He thinks he can solve all his problems VERBALLY. He refuses to get involved in the hard health care decisions and now goes to talk with the Olympic organizers when he hasn't talked with his general in Afghanistan. SHAME ON HIM! AGAIN, IT HAS NOTHING TO DO WITH HIS COLOR! John: We have come a long way on race problems in America, but it isn't all about white people acting out against the blacks. There are blacks who are just as bad. The race problem has always been since Bible days and it will go on until the Good Lord comes. It is sad but true. Mrs. Lou: John, the Republicans have forgotten they got us into the mess in which we find ourselves. Ronald Reagan sold his soul to the Southern Baptist Convention and other fundamentalist preachers and they are all race baters. Reagan kicked off his 1980 presidential run in the Mississippi town where three civil rights workers were killed and he talked about states rights. They finally convicted a Baptist preacher for setting up the murder of these three civil rights workers. The Republicans were race baters then and now. They can't stand it that there is a black man in the White House. How do you suggest Americans move away from the negativity so that we can unite and solve our most pressing issues? Do you think race has a place in the conversation? Are you thrifty? Take our survey! Assume the recession is over and you land $10,000 tax-free. Do you put all or at least some of it in the bank? Invest in a traditional or Roth IRA? Once the recession ends, will you spend less dining out than you did before the recession? At this very moment, do you know your credit score? At this very moment, do you know your bank balance? Consumer Reports surveyed more than a thousand consumers and found they learned big lessons from the Great Recession and vowed to permanently scale back their spending. A whopping 71% of Americans purchased only what they absolutely needed this year, 53% percent used credit cards less and 39% said they put more money into savings. How many questions did you answer with yes? "American Morning," weekdays from 6-9 a.m. ET. And check our her daily "Romans' Numeral." (CNN) — Florida Gov. Charlie Crist is standing by his recent prediction that President Obama may be headed for a massive electoral defeat similar to that which President Carter faced in 1980. Can Obama fit any more on his plate? 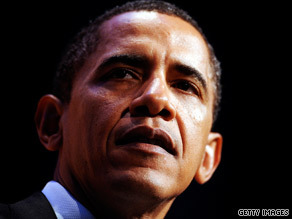 WASHINGTON (CNN) - President Obama faces a daunting fall to-do list against the backdrop of an American public losing enthusiasm on a variety of issues. President Obama's top priorities this fall are health care and financial reform. Obama's agenda ranges from dealing with Iran's nuclear ambitions to traveling to Copenhagen to pitch Chicago for the 2016 Olympics - a trip the president said two weeks ago he could not take because he was working on health care. "Health care reform has been his No. 1 priority issue here domestically. He wanted to make sure that if he went, that it wouldn't have an adverse impact on that, so he's going for just a day," said senior adviser Valerie Jarrett. And health care will still be at the top of the list when the president gets back. This fall, his priorities are health care and financial reform, one Capitol Hill source said. But health care reform will require a hands-on approach. The Senate Democratic leadership is looking for presidential guidance in creating one bill out of two very different ones - all the while holding onto enough votes to pass it. CNN is taking journalism to a whole new level today with the new CNN iPhone app. It includes live video, personalization tools and the ability to upload iReports. It costs just $1.99 at the app store. Watch as John and Kiran give it a spin on the "Magic Wall."